On a rainy summer’s day in Ha Noi, a group of Western backpackers, bags fastened to their muddy motorcycles, return to the crowded city after trekking through some of Viet Nam’s northwest provinces. Long and winding road: Pha Din Mountain Pass in Son La Province, a famous landscape and a must-see for tours to the northwest. It is no surprise that in recent years, the Northwest has become a popular destination for eager Vietnamese and Western backpackers with a taste for the unfamiliar. Cultural diversity is among many reasons why tourists have flocked to the region. “I had heard a lot about the Northwest of Viet Nam, particularly the famous [battle of] Dien Bien Phu, but only after I’d been there could I really experience the beauty of the colourful culture here. In particular, I was impressed with the highland fairs where we could communicate with the hospitable locals,” says Elisa Grimard, a French national. 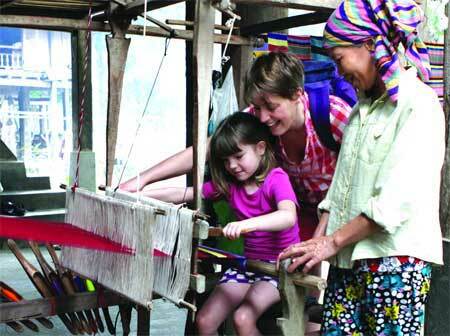 Textile talent: Foreign visitors experiment weaving brocade with Thai people during a home stay tour in Lac Village in Mai Chau District, Hoa Binh Province. The Northwest now consists of Lao Cai, Hoa Binh, Son La, Dien Bien, Lai Chau, Yen Bai, Ha Giang, Phu Tho provinces. The local markets are a vibrant hub for trade and cultural exchange, and word is spreading. For those looking to avoid the scourge of excess luggage, the northwest is fast becoming famous as the ‘land of traditional festivals’. Tourism maps boast an active calendar of fairs that have become famous across the region, including the Khau Vai ‘love market’ in Ha Giang and the Bac Ha market in Lao Cai, recently voted one of the top 10 most unique fairs in Asia. Travel agencies in Lao Cai are also offering tours to visit the acclaimed highland markets. 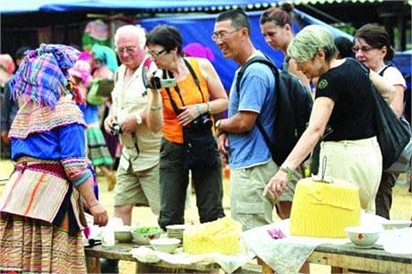 Bargain hunters: Foreign tourists visit the Can Cau fair in Si Ma Cai District, Lao Cai Province. Local markets are well-known as not only a hub for trade, but also opportunities for cultural exchanges. In Phu Tho, tourists can visit the remains of the Hung dynasty as an insight into Viet Nam’s cultural and historical origin. Visitors can also escape to the mountainous provinces and immerse themselves in unique folk festivals, ranging from the popular fire dancing festival of the Pa Then people to the horse races in Bac Ha. The region’s rich biodiversity provides a stunning backdrop for tours. Many tourists choose to experience nature first hand by traversing one of the many winding mountain passes. O Quy Ho in Lao Cai and Ma Pi Leng in Ha Giang have become a rite of passage for many young visitors to the region. Grimard recalls her fascinating journey along a picturesque 70km strech of road from Mu Cang Chai (Yen Bai) to Muong La (Son La). However, some of the most hearterning and enriching experiences can be found in visiting local ethnic communities. Their struggle for survival among nature are well documented in the vast network of caves in Dien Bien and Son La. New tours now allow visitors to travel along the rivers and hydropower reservoirs in Hoa Binh, Yen Bai, Son La, Dien Bien and Lai Chau. Le Quang Dao, deputy director of Viet Vision travel agency, says the Northwest provides an experience that is distinct from the rest of the country. Grimard’s friend, Michel Giron, says he found encounters with ethnic minority villagers a fascinating experience. “The men invited me to try their maize wine and they shook my hand every time we drank a cup. Despite a recent surge in the number of visitors, tourism development faces many obstacles, says Deputy Chief of the National Administration of Tourism Nguyen Manh Cuong. 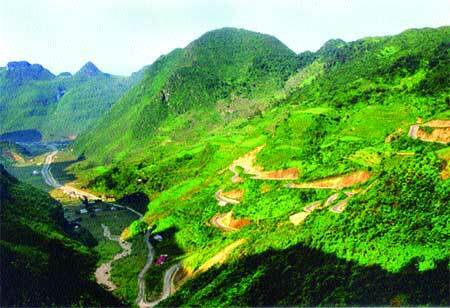 Picture perfect: The “Slope with nine curves” – a popular landscape in Ha Giang Province. To combat this, a cooperation programme has been implemented across the eight northwestern provinces to promote their value to tourists. Travel agencies are also helping, providing tours that increase the amount of time visitors’ spend in the region. In spite of this, local operators believe it will be a long time before the tourism potential of the Northwest is fully tapped. “With many years experience guiding tours in the Northwest, I know the community tourism potential here, but it will take a long time for local people to understand how to serve clients, prepare the dishes and meet their needs,” says Dang Xuan Son, head of the Responsibility for Tourism Club in Son La and Hoa Binh. Don Taylor, a consultant specialising in the Northwest region, agrees that a skills shortage is hampering tourism development. Locals lack an understanding of what tourists need, in addition to having poor skills in business and language, says Taylor. Community-based tourism is also very basic, meaning experience of local life and souvenir sales are limited. Nguyen Giang Nam, director of Asia Pacific Travel, believes the region will need to develop more sophisticated accommodation before it attracts more tourists, particularly those that will spend more money. 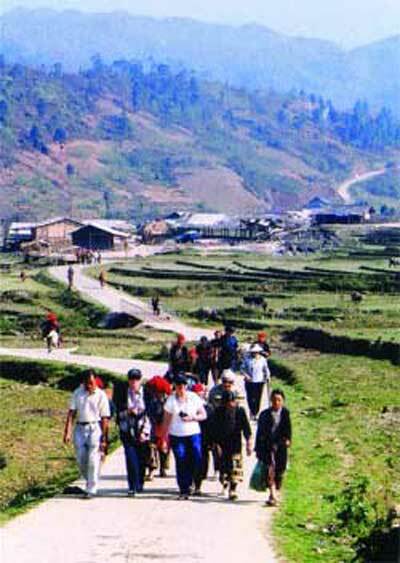 Striding forwards: Tourists visit Ta Phin Cultural Village in Sa Pa (Lao Cai Province). In recent years, many Vietnamese and foreign visitors have chosen the northwest as their number one holiday destination. Experts believe the key to tourism development lies with investment. Unfortunately, the response to calls for investment has been few and far between. 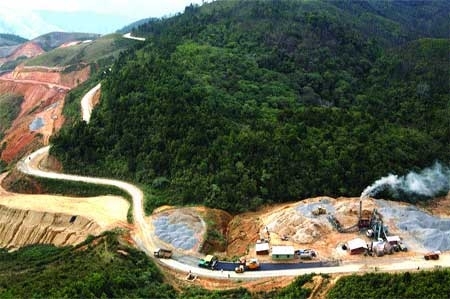 Some projects have even been calling for investors for over 10 years but investors are hesitant because of the difficulties posed by the rough terrain, says Pham Trung Luong, deputy director of the Institute of Tourism Development Research. So far, the eight northwestern provinces have pledged to collaborate on a “regional solution”, to improve promotion and human resource management. The provinces have planned to establish a Steering Committee for regional tourism and are partnering with travel companies to increase the number of tourists. “There is great potential for provinces to collaborate with service providers and travel agencies to attract visitors in large cities such as Ha Noi and HCM City,” according to Pham Thanh Tam from Vietrantour Travel. Provinces are also taking steps to safeguard their natural resources and ethnic communities. “We realised that to develop tourism we need to promote the unique cultural characteristics of each province. We also need to preserve the culture of ethnic groups in the provinces, as it is a precious resource,” says Ha Thi Nga, vice chairwoman of the Lao Cai administration. Many organisations are also playing a role in helping locals understand the needs of tourists visiting the region. “We understand the needs of the people so we support some villages to develop tourism such as implement environmental sanitation and advice for product ideas,” says chief of the tourism club Son. These efforts have had positive results and experts are increasingly optimistic about regional development. Progress is slow but steady, appealing to tourists like Grimard who is eager to discover more of northwestern Viet Nam.